Rabbi Shalom Carmy visited Jerusalem for an intensive week in January 2008 as our scholar-in-residence. 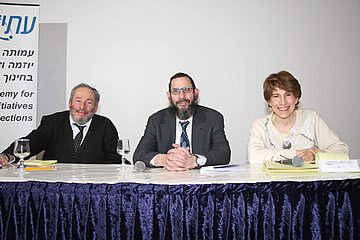 Right to left: Rabbi Chaim Brovender, Rabbi Shalom Carmy, and Prof. Susan Handelman (moderator) at ATID's 10th Annual Winter Conference (January 16, 2008). "Al Ahavat HaTorah ve-Guelat Nefesh Ha-Dor"
Rabbi Shalom Carmy is professor of Bible, Philosophy, and Jewish Thought at Yeshiva University in New York. He is the editor of Tradition: A Journal of Orthodox Jewish Thought, has authored scores of essays, and edited volumes for the Orthodox Forum series, as well as Rabbi Soloveitchik's writings on tefillah for the Otzar HaRav series.